A S&SS random dungeon generator, along with many other useful resources, is available HERE. Wizardawn's site provides a lot of cool resources for a wide range of old school fantasy RPGs, so make sure to check it out! Looking over the game, it hits a sweet spot for me. 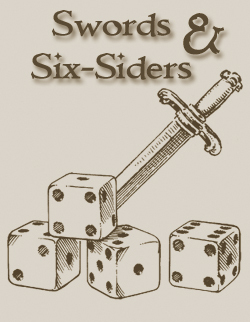 A simple d&d-esque game that uses d6. Were there ever any thoughts of making it all OGL (your original versions as well as new versions)? I could see a lot of potential with the system. So as much as the system is ideal, it puts a strain on wanting to work on anything for it. I'm sure you'd get a lot of interest. Whitebox is huge right now and IMHO, this is much better! Does anybody else have this issue on blogs when using their gmail addy or is it just me? Thanks Jerry! You make a good point, I am adding the creation of a broader S&SS license on my to-do list. Optional rules supplements and alternate systems are some things I am currently working on, along with some new adventures. I played this game yesterday. Very good job! If you're looking for an artist for upcoming books, I'd love to participate!